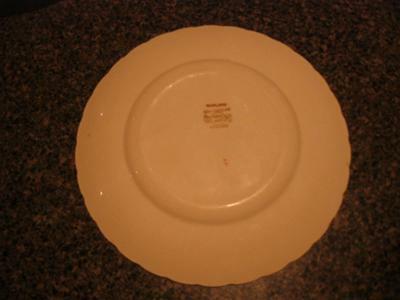 China Mark Query - Plain Royal Ascot Mark With 'Solian Ware' Also:- I came across this set when a friend asked me to help her purge some items from her house in preparation for selling. Tucked away in a corner of the furnace room, a simple box with minimal packing material. 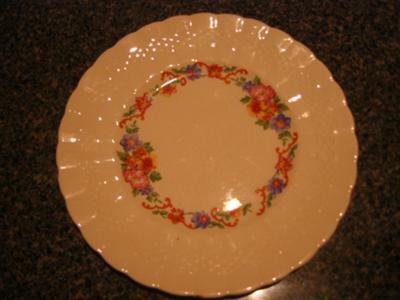 I thought it would be some dish set to donate to Goodwill, I looked at the pattern and thought to myself, "Hmmmmmm, this looks nice". A beautiful Basket weave design inset around the border and then a stunning garland of flowers inside of the basket weave. I asked where she got it from, she said it used to be her Grandmother's set. I turned it over and saw a Royal Ascot mark, but one I had never seen before. It said Semi-Porcelain not Bone China and there is no Top Hat in the mark as I have seen on other sets. I asked her if I could take it home and investigate what the history of the different mark might be, she agreed and I have taken a few pictures to illustrate exactly what the mark and pattern look like. I am by no means a mark expert, but i know where and how to research these things and have not found anything regarding this specific mark. 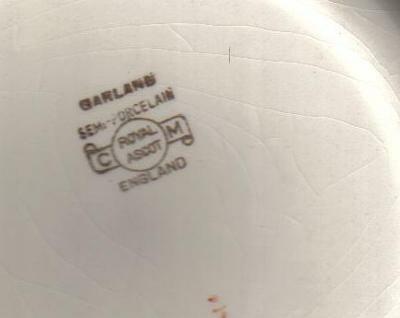 I know Royal Ascot has a deep history and I do not know when they made this set or used this mark. to the soup tureen is cracked and has a chip out of it due to the careless storage of the set. Still many of the pieces are in superb condition and I would love to find out more about the history of the mark and this set. P.S. After I went through the box a second time, because i was posting this. I found on the cups only, a different mark. They have Solian Ware (Potters) Ltd. Cobridge England, so I may have answered part of my question. But I would still appreciate any input from you fine folks. This is a great submission, thank you. I wish all could be as well written and interesting. 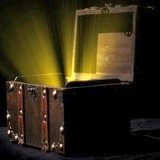 Great story of hidden treasure and how you used your 'gut instincts'. Solian Ware was a brand name of Soho Pottery (Ltd) based at Tunstall, Staffordshire from 1901 - 1906. Prior to that they were known as Smith & Binnall and then went onto become Simpson Pottery. In 1906 they moved to Cobridge and in 1913 introduced Solian Ware. They are known for earthenwares rather than porcelains which explains the damage as porcelain & bone china is harder despite being finer. In 1944 this side of the company ceased to produce under these brand names. 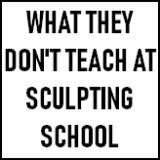 I understand that your answer applies to the Solian mark only. Though Royal Ascot seems to be known to everyone, I can't find a trace of the history of this maker. I actually have no clue if it is a maker, a series or something else. I found a set of 8 placing of Royal Ascot Empress 24 carat on the ground of a building which tenants had been evicted, and I felt sorry this was going to go to waste. My hope is that someone will give this set the love it needs - only four main plates remain but still... 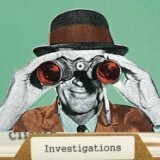 I am not looking for a value - it is all over the internet for sale anyway. The mark is gold or red so I suspect it is last quarter of the 20th century. But I would like to give whoever gets it some reference in terms of date. Geez, I could not even confirm if Royal Ascot is still in activity! Maybe this post will help others. - Thanks from Montreal, Quebec, Canada.